When I noticed my hair was thinning, the first thing I was started searching for was a list of the best vitamins for hair growth. I had heard about Rogaine (the product contains Minoxidil as the active ingredient), but I wasn’t ready to commit to a medical treatment as my first step in prevent my hair from falling out. Also, I was afraid of the possible side effects that might come with Rogaine. Propecia (Finasteride) is a prescription-based hair regrowth treatment for men. A number of people who take Propecia have proved over and over again that the treatment truly regrows hair. You can easily find before and after images proving the efficacy of Propecia. However, when you look at the primary side effect of the drug, the excitement starts to fade: possible permanent sexual dysfunction. The manufacturer claims that not everyone who takes Propecia experiences those symptoms, but do you really want to take the chance? Is hair regrowth worth more than messing up another, more private part of the body? Propecia is for men only, so to be honest, I don’t really have to worry about its side effects. But the point I wanted to make is that the chances are every medical treatment will usually come with a few (or more) side effects. The reasons for hair loss in women are more complicated than in men. It may be caused from any number of factors. Here, I will cover the most well-known reasons and how certain hair vitamins are created to promote hair regrowth (If you want to see the complete list of female hair loss causes and symptoms, read it here). 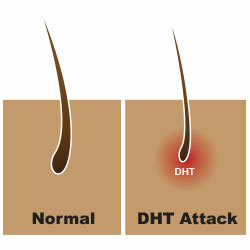 Many experts blame Dihydrotestosterone (DHT) as the main reason for causing hair loss in men and women. DHT is a converted version of the male hormone Testosterone. Wh en Testosterone combines with an enzyme called Type II 5-alpha reductase, it is converted to DHT which in turn slowly disturbs hair follicles from having a normal growth cycle and results in premature hair loss. Most hair specific vitamins you see online or in stores are focused on inhibiting DHT activities in our hair follicles, so your hair can start regrowing in addition to eliminating excessive hair shedding. A number of brands such as Viviscal have patented technology specialized in this area using natural compounds. Hair vitamins can be a great contributor to restoring your thinning hair and promoting healthy hair growth, as long as you do one thing: eat a balanced diet. In a previous article, I shared my personal story about chunks of hair falling out from excessive dieting when I was a teenager. Doing a one-food-only diet for many weeks, I ultimately achieved my ideal weight (Sorry I am not revealing it here :-)). But as a side effect (which I didn’t really think about back then), I was losing hair at a rapid rate. This made me immediately change my diet plan. Eventually, hairs were filling in those spots. But I know for a fact that I haven’t recovered all of my hair from that experience. You often hear or read about how a balanced diet is so important to your hair (as well as overall health), but unless something really bad happened (like my hair loss due to unhealthy diet), most of us don’t really pay much attention to it. I am hoping that sharing my experience here will increase awareness about the importance of eating healthy for the sake of fuller and thicker hair. Your hair is mostly made of protein, so eating protein rich foods such as red meat, beans and eggs on a daily basis are crucial to providing proper nutrition to your hair follicles. But your body also needs other types of vitamins and minerals like calcium, iron, etc. By consuming fresh vegetables, fruits, lean meats and whole grains (healthy diet plans and lists of foods for hair growth can be found in a previous article). 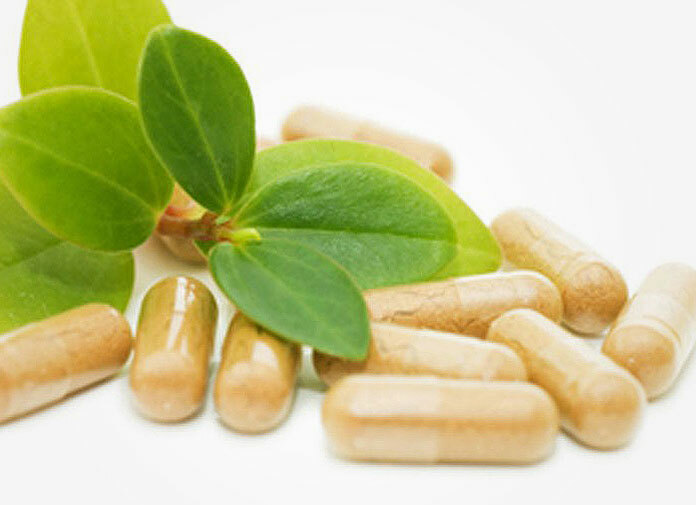 Based on my research into vitamins designed to stop hair loss and stimulate hair growth, these 5 supplements offer the best formula for your hair (as of 2014). Some of these brands even went one step further to perform clinical tests and trials for the best hair growth result. These hair-nutrition supplements are essential for people who are experiencing thinning hair or extreme hair shedding. The formulas created by each brand are truly unique and scientifically designed to promote hair re-growth by either providing essential nutrition, blocking DHT in the follicles, or a mixture of both. I talk about Viviscal a lot because I noticed the vitamin has really helped me reduce the number of hair strands falling out from my scalp. Whenever I brush or wash my hair, I see less hairs on the floor. Vivisal Extra strength is the original formula and is what Viviscal was first known for. There are numerous people (including celebrities) taking this daily and the majority have experienced positive hair growth results. The other one, Viviscal Professional, has similar ingredients to Viviscal Extra Strength, but it doesn’t contain iron. I used to take Viviscal Extra strength, but recently switched to the Viviscal professional tablets since I didn’t need extra iron in my body. The company mentions that what makes Viviscal hair vitamins special is a trademarked ingredient called “AminoMar.” AminoMar was created by a Scandinavian professor using a combination of molecules from fish and protein-based foods. The element’s function is to nourish thin and fine hair follicles and encourage normal hair growth. In order to prove its efficacy, the brand went one step further and performed five clinical studies, which is uncommon for vitamin manufacturers. The result of the latest study the company conducted shows that 81% of participants experienced a decrease in thinning hair and 75% saw the overall volume of their hair increase. This is very impressive, especially when you compare this result with the result from the most discussed new scientific method in hair loss industry – stem cell hair regrowth. Replicel specialized in hair regeneration and recently finished their first human clinical trial. It had a disappointing result of only 10% increase in hair density. No wonder there are thousands of hair growth reviews about Viviscal considering the amazing results actual users have experienced. Natrol offers biotin with the highest dosage you can get. If this is your first time purchasing a vitamin for hair growth, give Biotin a try. Biotin is a part of the Vitamin B complex and is the most commonly recommended over the counter vitamin by doctors for patients experiencing hair loss. Biotin plays an important role in producing healthy hair and cell growth. Numerous people who choose Biotin have hair thinning problems in some parts of their hair (especially the temple area) or all over the scalp. After taking it for several weeks (sometimes less), the majority of the users review that they love the result Biotin gives to their hair (less shedding and filling in thinning spots). A great thing about the Natrol Biotin is the price for the value you get. One bottle comes in 100 tablets which will last you more than three months. It’s the same price as the Venti size of a Vanilla Latte at Starbucks! When I saw this product for the first time, it reminded me of the infomercial products you see on TV. Maybe it’s the packaging that makes the product less appealing. Regardless, what’s most important is not the packaging, but what is inside. For the main benefit of the Hair Maxx supplement, the company points out that their hair vitamin is all about inhibiting DHT production using “solubilized Ketrain breakthrough” ingredients. The ingredients are composed of 20 different types of hair-growth promoting herbs, vitamins and minerals that are designed to increase thickness of hair diameter and decrease hair loss at the same time. I took a close look at each ingredient and noticed many of them are well-known natural ingredients that have been used to treat hair loss. For instance, Iodine (kelp or seaweed), included in the Hair Maxx vitamin, is a popular item consumed among people with Alopecia Areata (bald patchy hair loss). There are also popular herbs such as nettle leaf and saw palmetto included in the formula. Those two natural herbs are known for lowering the damage from DHT to hair follicles. 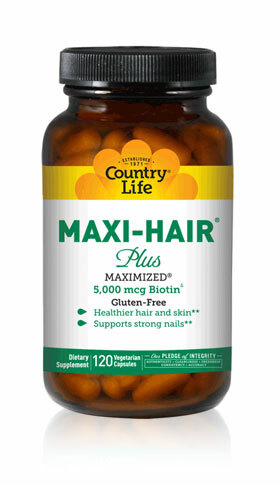 If you are looking for a more affordable alternative hair supplement to Viviscal, consider the Country Life Maxi Hair vitamin. This vitamin is designed to provide essential nutrition to your hair and nails and is packed with different vitamins that are known to promote hair growth (Biotin, MSM, Vitamin A, and Folic Acid, just to name a few). Taking the Maxi Hair vitamin for several weeks, you will notice your hair feeling thicker and healthier. Another thing I noticed when I first took this supplement is that it made my urine bright yellow. The color eventually faded as time went by. What’s interesting about this vitamin is the fact that they incorporated time-release technology in their formula. According to Wikipedia, this mechanism is often used in capsules or tablets for your body to absorb the main active ingredient (in this case, what makes our hair grow properly) over a slower period of time into the bloodstream than immediately releasing it. In this way, your body can take advantage of the full benefits the vitamin is supposed to provide without any waste (Click here to see the complete ingredient list). I often get emails about African American hair type and if there are specific vitamins for black hair growth. Hairfinity is often referred as the go-to supplements for curly and coarse hair. It is a reputable brand that has been around for years. One interesting thing I noticed after doing some research is that Hairfinity and Maxi Hair share very similar ingredient lists. The reason I listed the Maxi Hair vitamin instead of Hairfinity is that Maxi Hair mostly offers higher amounts of each of those ingredients. Best of all, the Maxi Hair price is also much cheaper than Hairfinity. The article above covered important aspects about choosing hair vitamins and supplements as well as the top 5 recommendations for the best vitamins for hair growth. If you are still unsure of what to choose, start with something that is already popular among women who are experiencing hair loss, such as Viviscal Extra Strength tablets. With 7 clinical trials and officially proved results all over the media, you can’t go wrong. I take Maxi Hair everyday. They are great because I don’t feel sick after taking them on an empty stomach (unlike other vitamins). After taking it for several weeks, I’m surprised how much fast my hair is growing! My hair feels much stronger, less shedding! The yellow urine is from the B vitamins. It’s normal. I just bought the Pantene Regrowth Kit. I have a form of Leukemia that has affected my hair.I am not your typical chemo patient. I take a target chemo pill daily and have had great success with it. My hair is thinning and falling out, but I wont go bald. I have my fingers crossed that this will help. I am very sorry to hear about your hair loss related to Leukemida, but I am really glad to hear that you are having success with the target chemo pill. Any Minoxidil (including Pantene Regrowth Kit) is recommended to use at least 3 months to see results (even though some women see the results much faster). hi, I am 26 years old female suffering from telogen effluvium due to accutane..can you please suggest what vitamins is good for me? and if you’ve seen any accutane hair loss sufferers gain their hair back? I found helpful answers regarding temporary hair loss due to Accutane from dermatologists. To sum it up, it is noted that while Accutane does not cause complete baldness, it can cause noticeable hair loss during the medication period. If this continues, you may need to reduce the dosage or discontinue the medication. In many cases, telogen effluvium is considered to be temporary hair loss. In other words, if you discontinue whatever is causing it and give it a bit of time, your hair is likely to come back. As a final note, please make sure to have a balanced meal (protein rich foods) and take hair supplements to nourish your follicles. Hope this helps and let me know if you have any additional questions. Can Viviscal and Hair Maxx both be taken as supplements at the same time? On Viviscal bottle labeling does it state that it contains DHT blockers? Taking both could give you too much of one or more of the ingredients, which could causes a possible overdose. In order to be on the safe side and get the full benefit each supplement provides, it would be a good idea to take one supplement (brand) at a time for at least 3 months (as a side note, Both Viviscal and Hair Maxx recommend 2 tablets a day). For Viviscal, the label does not state that it contains “DHT blockers.” However, Viviscal’s official website clearly mentions that their formula is designed to help women with thinning hair by providing essential nutrients to hair follicles for the longer hair growth phase (also known as the Anagen phase). One key note: The Viviscal Extra Strength supplements (pink package) contain “iron.” In other words, unless your hair loss is due to iron-deficiency (which can be easily found from a simple blood test with your physician), I would go with Viviscal Professional. 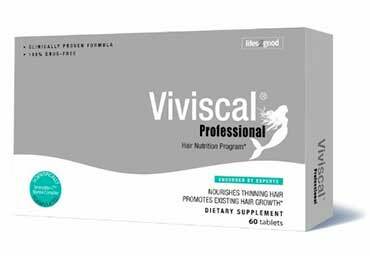 Viviscal Professional contains a higher dosage of their trademarked hair nourishing ingredients called AminoMar C (58% more), but without iron. Hi! I noticed my hair thinning in the front on the sides mostly. I noticed it happened a few months after I became a vegetarian. I do take a multivitamin daily which I see has a lot of Vitamin A (500%) but not enough Biotin (33%), Folic Acid (100%). My question is which supplement would you recommend that would have more of the Biotin, Folic Acid, and other aminoacids and less of the Vitamin A? Or is there no such thing? Also, how long should I take the supplement before I start seeing results? I believe Maxi Hair (see the recommendation section in the article above for details) is probably the closest vitamin you are looking for. It contains a high percentage of Biotin (2000 mug – 667%) as well as Folic Acid (400 mug – 100%). BUT, an important note is that it also contains 5000 IU (100% Daily Value) of Vitamin A, which will be way over the recommended daily intake of Vitamin A if you combine it with your multi-vitamin. If you would rather continue the multivitamin and while avoiding hair supplements that also contain Vitamin A, Viviscal (found above) and New Nordic Hair Volume are two good options to consider. For instance, New Nordic Hair Volume contains high percentages of Biotin (1000%) as well as high amounts of other well-known hair growth ingredients such as Apple, Millet and Horsetail extracts. It’s usually recommended to take hair supplements for at least 3 months before seeing results, but you should always read and follow the dosage instructions on the supplement labels. Here are the ingredient lists for both of the supplements I mentioned earlier if you want to get more specific dosages for each of them. If you would like to speed up your hair growth, biotin is generally the #1 recommended vitamin for hair growth. Also, please make sure to have a balanced diet in order to provide essential nutrition for your hair follicles to grow properly. Based on my research, fish oil is a great supplement to take for your health in general, but it’s not shown to create more growth effects than biotin. Well..I’m 40 and of course most likely hormones are causing me to lose my hair. I do think I need to have a more balanced diet which I’ll be working on, but, do you also know of any supplements that prevent hair loss? I’m not sure that there’s anything out there (unless prescription) that can generate new growth as much as there are supplements that just helps the hair grow fast, but, if you know of any please let me know. I really appreciate your information…great tips 😉 ! Most vitamins mentioned in this article are focused on preventing hair loss rather than helping hair grow fast. One of my recommendations is Viviscal. 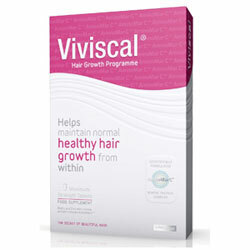 In this article (http://www.msfullhair.com/hair-growth-products/viviscal-extra-strength-dietary-supplement), I included a video which is a CBS interview about Viviscal results. The woman who was shown in the video experienced female hair loss pattern and took Viviscal on a daily basis. The video shows before and after pictures of the women and you will see big improvement with new hair growth. 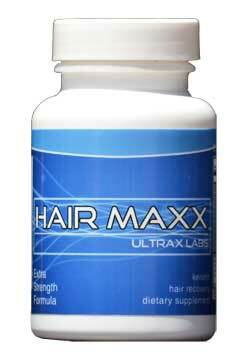 Another vitamin that is gaining more popularity is Hair Maxx by Ultra Labs (see the article above). The company specifically selected a number of herbs that are designed to reduce unnecessary hair loss. Hi. After being diagnosed with telogen effluvium 5 years ago due to extreme dieting and then stress due to work and family bereavements. I have tried a lot of things since to try and help it. My dermatologist 2 years ago said to try slow release multivitamin with slow release b complex vitamin and zinc along with prescription iron 210mg as my ferritin levels were below 10. I also use minoxidil 5%. I still seem to be losing hair and still have very fine hair at front and along parting of my hair line. I also have alopecia areata above my temples. Could you let me know if there is anything else I can take or do to help please. Hi, I am really sorry to hear about your situation. Other than b complex vitamins, have you tried other hair-specific supplements (Viviscal, Hair Maxx, etc)? I listed some of them above, but there are many other options to choose from. Laser therapy is another option, which comes in 4 different forms: brushes (cheapest), combs, helmets, and office visit (most expensive). Another thing I can think of is a derma roller. I came across a research about the effectiveness of derma roller related to hair re-growth and participants in the research witnessed 5 times more new hair growth. Here is an article covering more details about the research as well as results. It sounds like your dieting and stress may be affecting your hair more than most, which could be blocking all of your attempts to recover from hair loss. Reducing stress and balancing your diet will go a long way to helping your hair respond to some of these treatments. It could be a b12 deficiency. B12 is only found in animal products and is an essential nutrient. My telogen effluvium was found to be caused by a b12 deficiency and a regimen of injections finally stopped the hair fall. A simple blood test can tell you. I have tried many hair vitamins. I am in my mid 50s and my hair is thinning terribly. I’m sure it’s all hormonal. I’m taking hair volume now and was wondering if you think viviscal is a better option. I do take a biotin and fish oil supplement as well..
Can I OD on biotin? Thank you for the thorough article on the topic. Undoubtedly, the best way to promote hair growth is to oversee the intake of the essential vitamins which enhance healthy hair growth. I personally have been taking Hairburst supplement for very long time and I could say that this is the BEST vitamin product on the market!!! I tried many brands and had never noticed any difference with my hair or nails. I was thrilled to find this product to help with hair and nails. I absolutely love what it did to my hair, skin and nails. My nails are a lot stronger, hair is shiny and grows a lot faster. This product is a much better quality than any biotin I’ve tried, and it doesn’t make me break out! I regrew my hair and you can too. -I’ve been bleaching my hair on and off since forever. My hair wouldn’t grow any longer it would just snap off. I’ve dreamed about having thick, long hair. And when I say dreamed, I mean it quite literally. So i decided to do something about it. My friend suggested Biotin when we were talking about my hair loss. I’ve tried like 4 different brands until i found that the best one for me. Now i’m 26 and I’ve been taking Biotin every day for years. My hair and nails grow SO much quicker. Hair has increased in the rate and are so long now. Also my energy levels are high. I remember that at the beginning i did heavy cardio and interval training which helped me lose weight fast but i did not realize how biotin played a part in my weight loss until AFTER i stopped working out. I continue to take biotin every day and now that I am no longer on my diet i eat whatever i want and i don’t gain weight. It appears the biotin may be keeping my metabolism to the level it was at during my training. So i highly recommend it to you. For me the best is certifiedbiotin my friends also use this one.